Serifos is known as "the barren one" and for good reason: it is one of the least green island of the Cyclades. According to legend, though, its one-time king Polydeukes was turned to stone along with everything that was beautiful on the island. The story, more like the script for a soap opera than a section of popular mythodology, goes as follows. Perseus was reputedly washed up on these rocky shores as a boy along with his mother Danae. The capital Serifos Town is built on a hill that overlooks the bay and Livadi, the harbor. Like most Cycladic capital towns, Chora is densely built, resembling a fortress, to defend itself from the frequent pirate raids that ravaged it until the 17th century. Serifos used to derive its wealth from its mining industry, and, in the beginning of the 20th century, it was the site of some of the first violent industrial action to hit the then industrializing country. Today, the island of Serifos is sparsely populated and it relies on tourism to make ends meet.It is a quiet destination, fit for families and people who are looking for peace and beauty in their vacations. Its local cuisine is typical Cycladic, based on organically-grown vegetables and seafood, and it also produces a distrinct range of desserts. Online Travel guide with the best accommodation in Serifos (Seriphos). Find the cheapest hotels is Serifos & get exclusive online deals. Great rooms at bargain prices. Book online now! Compare Hotel Prices and read Reviews from others. Great Hotel rates and information See photos, reviews & what's nearby Serifos . 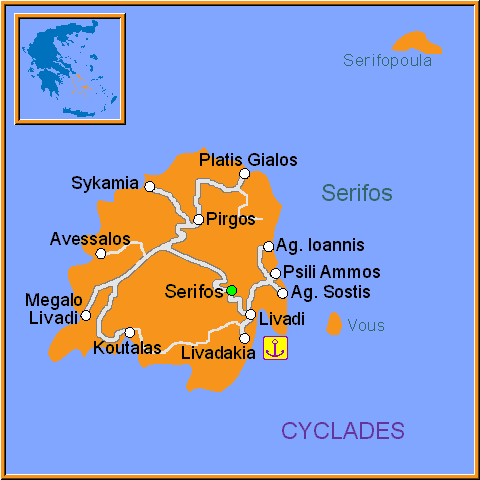 Detailed tourist and travel information about hotels of Serifos providing also regional information.